Hold onto your seats, folks, cos this is it. In a word, the performance of the Integra Type S can be described only as breathtaking. Sure, with a 0-100 in the mid-high Sevens, there’ll be plenty of school kids who immediately point to the times of other, apparently faster cars. But they haven’t driven a Type S. Point to point on a twisting road, this Honda is just so fast that you need to look at a very select bunch of cars – usually with turbo and all-wheel drive – to come even close. 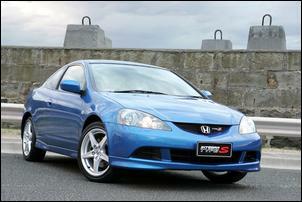 But the truly amazing thing about the Integra Type S is not its outright performance, nor its brilliant handling. It’s the fact that the car is just as happy pottering off to the shops, or taking Gran out for an afternoon. Ride comfort? Firm – but fine. Idle quality from this incredible naturally aspirated engine that develops over 100 hp/litre? No problems at all. Tractability – say, the ability to progress normally while short-changing at 3000 rpm? You can do it all day. But slot the six-speed back to second gear and nail it all the way to the glorious 8500 rpm rev cut and time and space become compressd. Previously blasé passengers, lulled by the docility of the Honda, start screaming expletives and the winding road fast-forwards with pace and assurance seldom seen in any car. 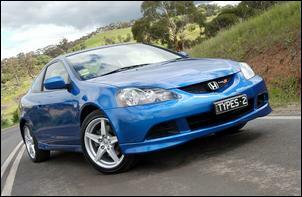 When the Type S Integra replaced the Type R, enthusiasts could be heard bemoaning the fact that the Integra had ‘gone soft’. With a slower steering rack, softer suspension and (hmmm! 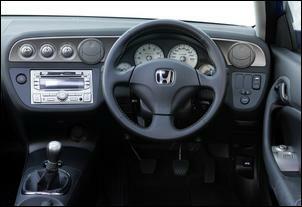 ), more power, Honda was said to have sold out. But all that’s simply garbage. When we tested the Type R we made comments like "not ideally suited to everyday driving", "small steering inputs send the car darting left or right", "considerable torque steer", "ride is ultra firm", and "very tiring to drive fast in lengthy bursts". In short, it was a car with an ultra-hard edge – and one that told you about it every second of every drive. The AUD$42,990 Type S is vastly more sophisticated – and must have been far harder to engineer. It does everything that the Type R could do, but does it with assurance, polish and finesse. You can still drive it blindingly fast, but you can also commute to work without being wrung-out every day. Unlike many performance cars, which we think would lose their everyday appeal within a month of purchase, the Type S is eminently liveable – a practical car that can perform the humdrum and yet still provide amongst the best thrills we’ve ever had while driving. So what makes it so wonderful? Let’s start under the bonnet. One of the world’s greatest engines – and certainly the best naturally aspirated four cylinder we’ve sampled – is an all-alloy, DOHC 2-litre. 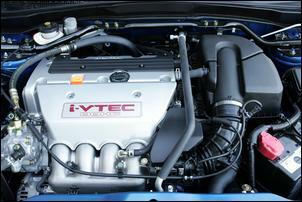 Much of the magic is in the valve timing – Honda’s i-VTEC variable lift and overlap system together with variable cam timing. The engine is a ‘square’ design (bore and stroke both 86mm) and compression is a high 11:1. The result is 154kW at 7400 rpm... and 194Nm at a stratospheric 7000 rpm. But that last figure is extraordinarily deceptive – for this is not a car that needs to be revved hard to go places. It’s normal to be changing gear at 2-3000 rpm; helped by the very low gearing (final drive ratio is 4.764!) and the close-ratio 6-speed box, the engine is always tractable and unfussed. In fact, it’s possible to trickle along in first gear with the clutch right out and foot off the throttle, or be in sixth gear at 60 km/h – and even climb rises in the road. Of course, reach a larger hill in sixth at this speed and you’ll need to change back a gear, but in the driving, the 7000 rpm peak torque figure is never felt. However, Honda engineers have obviously dialled-in a lot of ignition timing at light loads; despite the required use of premium fuel, a couple of times we could hear detonation at small throttle openings at low revs. This is probably a car to always run on 98 octane. The power gets down to the road very well – unless really provoked, there is little wheelspin in dry conditions and much less torque steer than occurred in the previous model Type R. No electronic traction or stability controls are fitted, so the grip comes down to the mechanicals – and the 215/45 Bridgestone Potenza RE050’s worn on 17 x 7 alloys. The front wheel drive handling of the Type S is outstanding. The 2.59 turns lock-to-lock steering has lost the nervous dartiness of the previous model - helped by the use of bearings (rather than bushes) in the strut tops, it feels linear and precise. Turn-in is good and the ability to adjust the yaw angle of the car with the right foot pronounced. Very mild understeer is the order of the day but get off the power and the tail will immediately come out. However – in dry conditions at least – it’s easy to thread the needle between understeer and oversteer, the car feeling nimble and controllable. And that behaviour is not confined to just smooth surfaces; even on bumpy back roads, the Type S tracks well. In these conditions the suspension can be felt working hard but it hangs on and on. But with a car like this, it’s easy to start talking as if every road is a racetrack: in any normal driving, the Honda literally just goes where it’s asked to. We also thought the ABS calibration needed work. It’s clear that it has been set so that intervention occurs quite late – however the corollary of that is when braking very hard from high speed, the car can become disconcertingly twitchy. We had the feeling that a high-speed emergency brake could see the car get a long way out of shape. The ride is deceptive. Initially it’s possible to think that it’s too firm – smaller bumps tend to get through and the car’s ride seems to reflect the 45-series low profile tyres. But hit a bigger bump – especially at speed – and the impact is far more subdued. Like all good sporting cars, the Integra’s ride smooths out as you go faster. The suspension control is superb – do the old trick of driving over flat-top urban speed humps fast and you quickly realise that this suspension is a long way from the ‘stiffen it and lower it’ school of design. With all this mechanical brilliance, we found the cabin a pretty ho-hum place. As usual with Hondas, the climate control doesn’t regulate temperature very well when driving on a day when clouds are passing over the sun, and the knobs controlling the system look pretty cheap – but maybe some will love ‘em. An integrated in-dash six-stack CD is provided but it’s nothing outstanding in this pricing class. Rear seat room – especially headroom – is startlingly bad, and even front headroom is borderline. Certainly, this isn’t one of those capacious two-doors that belie their svelte lines. Best to regard the Integra as a two-seater (the rear seats fold flat to give a large and usable cargo area) with just small children or emergency adult rear accommodation – especially since there are no rear head restraints. In addition to the stacker, equipment includes leather seats (with poor lower lumbar support), a sunroof (that opens over only half its area), rear spoiler and dual front and side airbags. Other negatives? Well, the engine passes through some very noticeable tingly resonances on its way up the redline - but given that you’ll only be heading up there when really going for it, for most people the trade-off will be acceptable. On cold start the engine revs as high as a disconcerting 2000 rpm, and with a combined official highway/city fuel economy average of 9.4 litres/100 km, fuel economy isn’t wonderful. The glowing red odometer/trip meter digits we found a distraction, and we’d also like to see switchable stability control – after all, the system in the Accord Euro allows plenty of driver input and so diminishes the fun very little. In this pricing range, cruise control is another notable absence. But really, exactly as it stands, this is a quite fantastic car.